There is something simple and nostalgic about Mason jars. I love their simple, shiny clean look, and how they hold the promise of something delicious held over from the garden’s harvest. John Mason invented and patented the first glass jar with a screw-on cap in 1858, and though he didn’t make much money from his invention, as his patent expired and lots of rivals came along, his name is still the one we use to refer to the jars with threaded two-piece lids: Mason jars. I love to see pictures of people using Mason jars as storage, like this blogger does so well; check out her details at The Happy Raw Kitchen. 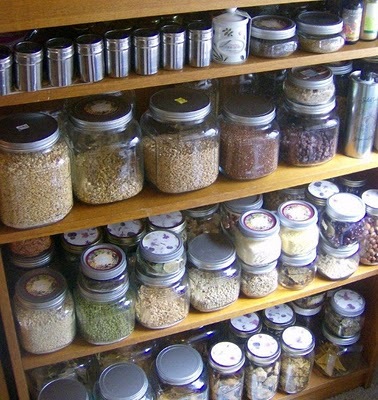 See how cute her pantry is? Mason jars plus jars of all sizes are so pretty, but they’re also practical. They keep moths out of your food when adequately screwed down, they add no funky chemicals to your food like some cheap plastic storage might, and they’re inexpensive. I also love this cute candle idea from TheFrugalGirls.com; what do you think? 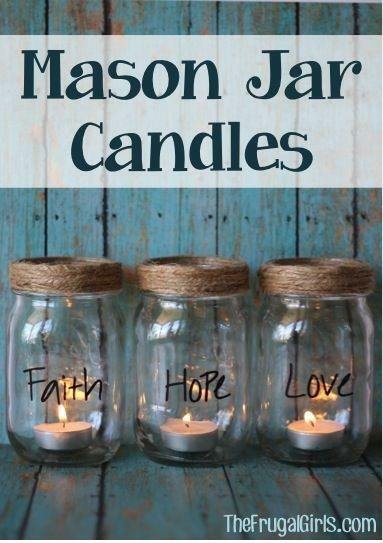 Well, I have another favorite use for Mason jars to share with you. It’s becoming a pretty popular idea on sites around the web, including, of course, Pinterest, and with good reason! You simply layer ingredients for your salad and store in the fridge, tightly closed, for up to ten days. Salad dressing goes in the jar first, and your salad greens last, so they don’t contact each other until you’re ready to eat, thus saving your salad from becoming limp. 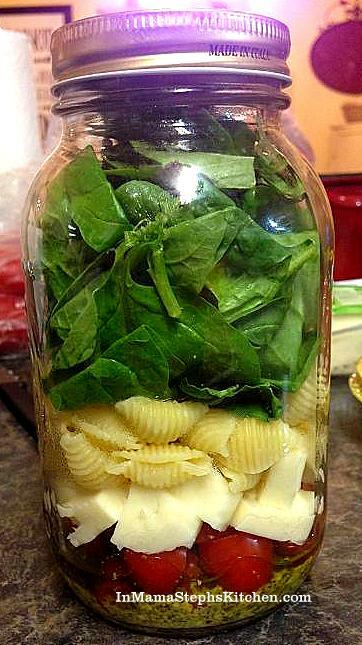 Leave a little open space at the top to shake up jar when ready to eat. If packed too tightly, it’s harder to distribute dressing. Here’s another variation I totally loved; hope you do, too. 2-3 TBS of your favorite dressing, such as strawberry or raspberry vinaigrette, balsamic vinaigrette, etc. Shake when ready to eat to distribute dressing. A layer of pasta would work in this salad, too, if you have some left over from the Caprese salad! I never say no to pasta. 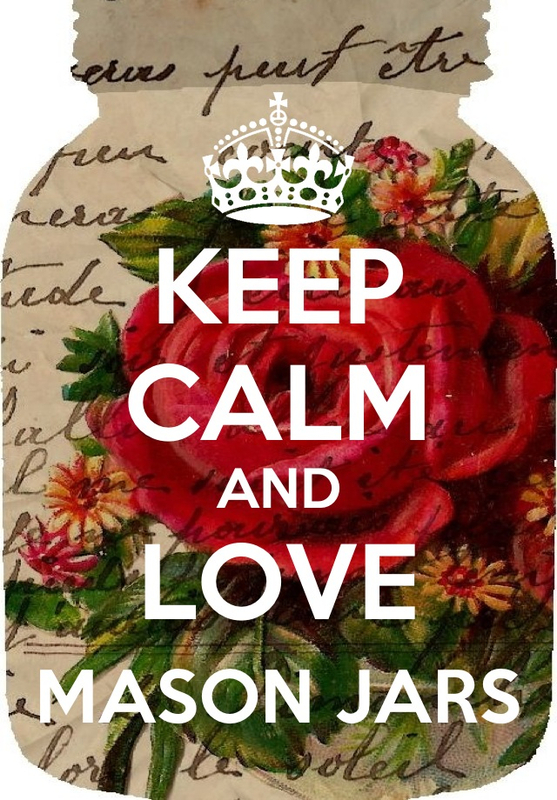 I hope you enjoy trying these easy recipes; what is your favorite way to use Mason jars in your home? Next Post Sweet roll cake: all the flavor of cinnamon rolls without the work! I love your site! I’ve also been making Martha Stewart’s banana bread for years, but my kids love it with mini chocolate chips stirred in!